Barbarella is a famous character who's traveled through space. There are places she visits that are welcoming, whereas other places she visits are less than welcoming. 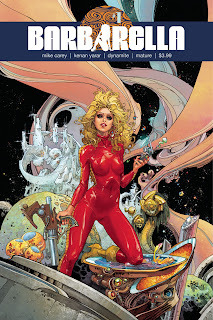 In Barbarella #1 from Dynamite Entertainment, her latest destination is something that leaves a lot to be desired. The issue is written by Mike Carey, illustrated by Kenan Yarar, colored by Mohan and lettered by Crank!. Barbarella as a character has been around for quite some time, but fortunately for the reader Carey doesn't require that they be that steeped in her reputation. Much of the dialogue actually moves around Barbarella, but that doesn't stop Carey from introducing her as one fully confident--brash even--in her abilities. The world Carey has created is one rife with subjugation and most of the issue is actually spent exploring the world that Barbarella has stumbled upon in setting it up as a police state dictated by a blind commitment to faith. The first half of the issue sets that stage while Carey lets the second half of the issue set up the remainder of the series as Barabrella moves from one incident to the next. The pacing in the issue doesn't suffer as a result, with Carey relying on that dichotomous approach to keep things moving pretty cleanly. The artwork by Yarar is loose in many ways. Barbarella maintains her trademark appearance while the rest of the characters all sport a look that's befitting of individuals in a relatively dystopian society; the somewhat scratchy style works as it allows Yarar to reinforce that apocalyptic environment. Yarar also does a lot with the panel layouts, throwing a flurry of insets and overlays at the reader to keep the visual pace of the issue moving well. There's plenty of action sequences throughout the issue that Yarar does pretty well, emphasizing hand-to-hand combat and a variety of gunplay.Mohan's colors are pale but still vibrant at the same time, covering the illustrations with a sort of pall. Barbarella #1 is a pretty slick space adventure that reintroduces an old, familiar character. Barbarella is being thrust into an entirely new world to contend with and that world is full of chaos and danger. Carey's approach is pretty solid, helping the reader get into the flow of things without bombarding them with information or forcing them to brush up on the character first. Yarar's illustrations are a good match for the issue as well, in that their rough and tumble look is appropriate. Barbarella #1 is a lot of fun and things are only going to get crazier from here. Barbarella #1 is available December 6.